Our 59th meeting took place on Friday 7th July at the BP Upstream Learning Centre in Sunbury-on-Thames and was hosted by The Hydrographic Society UK (THS UK). Amongst the eleven presentations topics included Crowdsourced Bathymetry, Safe Fishing in UK Waters, the use of Marine Mammals as Observation Platforms and a look at a completely new Biofouling Technique for the Marine Environment. A full report on the day’s proceedings along with presentation downloads (as available) will be published here in due course and announced via the normal media outlets. All present agreed that the sell-out event was a great success combining a diverse programme of presentations with an excellent venue. Congratulations are offered to the organisers, The Hydrographic Society UK. Plymouth Marine Laboratory (PML) hosted the 58th Marine Measurement Forum (MMF) over a two day period in mid-September when delegates were afforded the opportunity to visit the wide range of marine science facilities that Plymouth has to offer ahead of the seminar itself. On 14th September attendees were invited to join the PML hosts at the Plymouth University Marine Station for tours of the station’s facilities and the research vessels of PML, Plymouth University, the Marine Biological Association and Sonardyne Ltd. This provided a great opportunity to showcase the wealth of local collaborative resources that the area offers to both marine science and industry. As is usually the case the sun was shining in Plymouth and a well-attended evening BBQ, hosted by PML, concluded an enjoyable day allowing great networking opportunities. The main MMF event was held the next day in PML’s modern conference facility. With approximately 70 delegates present Professor Stephen de Mora, PML’s Chief Executive, welcomed attendees and introduced the impressive programme of thirteen presentations. The first talk of the day was given by Elizabeth Paull from Aquatec Group who discussed applications for underwater optical communication devices. Following Elizabeth was Robert Camp from SAHFOS, who presented on the use of a Flow Cam Macro for rapid quantification and identification of zooplankton captured on their suite of Continuous Plankton Recorders (CPRs). To round up the first session Carlos Campos from Cefas presented a satellite based approach to monitoring harmful algal blooms and water quality for shellfish farming. After the first of the day’s productive networking breaks the second session commenced, focusing on autonomous systems for data collection. Sam Forbes, RS Aqua, showcased integrated sensors for fisheries’ applications using a Liquid Robotics autonomous Wave Glider. Continuing the theme of unmanned surface vessels Mike Poole from AutoNaut and Phil Johnston from Seiche presented their collaborative work on autonomous passive acoustic monitoring. They were followed by Jim Gardner from Valeport who reported on interesting local applications for the RapidCast system which enables underway acquisition of high resolution speed of sound measurements. The concluding talk of this session was given by George Graham from SAHFOS, who discussed his work in integrating additional autonomous sensors to the laboratory’s fleet of aforementioned CPRs. After lunch Roger Scrivens, speaking on behalf of the MMF Steering Group, updated the audience on plans for MMF 59 through to MMF 61 in 2017 and 2018. Lucy Maclennan, Fugro EMU, then presented work that the company had completed on a Poole Bay nearshore replenishment trial followed by Stuart Slade, Sonardyne, who provided an update on the company’s capabilities in seabed geodesy. To round up this session, Martin Bishop from Emeritus Solutions reviewed his work on thermionic valves and underwater acoustics. After another boisterous networking break Stephen Taylor from Geomatrix opened the final session by presenting on a Heuristic Tidal Advisor which turned out to be a novel method for tidal prediction. Then Jim Gardner, Valeport, returned to the stage for his second presentation of the day when he reviewed a recent local tidal surge, which caused the sinking of several small boats in a Plymouth marina. Jim’s detective work led him to conclude that the likely source of this surge was a series of large thunderstorms moving up the English Channel. The day’s final talk was given by Tim Smyth from PML who presented some recent work on autonomous monitoring of ship’s emissions. The programme was closed by PML’s James Fishwick who had headed up the organising team. He thanked all the speakers for what had been a very interesting and informative series of presentations. Attendees were then granted the opportunity to tour PML’s many areas of interest including the new state-of-the-art single cell genomics facility (a joint project with the University of Exeter); the mesocosm facility; the seawater hall, highlighting some of PML’s plankton research; and a high level overview of the work of PML’s world-class remote sensing group. On Thursday March 3rd, more than 70 marine industry professionals assembled at HR Wallingford’s offices in Oxfordshire for the 57th Marine Measurement Forum. The day encompassed 15 technical presentations, multiple networking opportunities, enticing warm muffins and a tour of the on-site test & trial facilities. Following a warm welcome from HR Wallingford’s Chief Executive, Dr Bruce Tomlinson, the first session, chaired by Dr David Todd of HR Wallingford, was opened by Dr Chris Minto of Optasense. His presentation outlined a new method for measuring wave height and tidal flow from seabed-mounted fibre optic cables using Distributed Acoustic Sensing (DAS). Tom van der Vlugt, Radac B.V. continued with the wave theme, explaining how FMCW radar can be used to measure wave heights, periods, directions and more. Professor Paul Taylor from the University of Oxford followed with a talk on advances in measuring the shape of waves in both deep and shallow water. After a coffee break and some fresh pastries, Dr José M. Alsina from Imperial College London opened the second session by examining how modern physical modelling laboratories are making measurements of coastal sedimentary processes and exploring the advances and limitations in instrumentation for measuring sediment transport. HR Wallingford’s Dr Jon Taylor then presented on the procedure for measuring dissolved oxygen (DO) and the reasons why DO should be an important consideration when planning and executing dredging works. Charline D’Hoekers, IMDC nv, presented on a time series of field observations of scour made using a frame attached to a jacket foundation, before Louis-Robert Cool, dotOcean nv, rounded off the discussion on sediments by looking at a new technique to determine the thickness and strength of underwater sediment layers. After a well-received buffet and some lively lunchtime discussion, Dr James Sutherland opened the afternoon session, chaired by Dr Jon Taylor, with a short introduction to the new EU-funded Hydralab+ project. This was followed by Dr Sean Gaffney, NOC Liverpool, who provided an introduction to the Marine Environmental Data Information Work (MEDIN) project which promotes the smart storage and sharing of oceanographic datasets. James Cowles, ASV, explored the potential for autonomous surface vehicles (ASV’s) to be used as passive acoustic monitoring stations in cetacean research and was followed by Peter Dobbins from Ultra Electronics Sonar Systems, who presented on turbulence and the positives and negatives of shadowgraphs, including their ability to (sometimes) see great distances. The first afternoon session was rounded off by Martin Stemp from RS Aqua who discussed his company’s new acoustic release and passive acoustic recorder units. Following afternoon refreshments and more networking opportunities, the final session of the day commenced with Tom Hill, Titan Environmental Surveys, who spoke about the challenges and triumphs in charting and surveying a reservoir in Tajikistan. This was followed by a talk from Valeport’s Jim Gardiner who showed some excellent results obtained in Plymouth Sound using an autonomous winch to deploy a CTD for salinity and sound velocity mapping. The concluding presentation was provided by Ted Read, Ohmex Ltd., who introduced the HyDrone Remote Controlled Vessel (RCV) which aids in conducting bathymetric surveys. At the end of the day, all attendees were invited to take a tour of the HR Wallingford physical modelling hall and UK Ship Simulation Centre, with a chance to see the world-class Fast Flow Facility up close! Dr David Todd, chair of the event, closed the day by thanking all of the speakers, adding “it is great to have so many interesting topics and candidates from such diverse fields of expertise all in one place.” Delegates expressed great satisfaction with the day’s proceedings and thoughts turned immediately to MMF58 which will be hosted by Plymouth Marine Laboratory on 14-15 September 2016. Paul Taylor et al The average shape of large waves in shallow water, and what do buoys actually record? The National Oceanography Centre hosted the 56th Marine Measurement Forum on 15 July in what was a rare excursion out of the South of England. The event was held in the Foresight Centre, adjacent to the NOC’s Liverpool site and saw a strong turn out of around 50 delegates in attendance. Speakers from a range of organisations; industrial, academic and professional bodies gave presentations and there were opportunities for delegates to visit the NOC’s Liverpool workshops where the Ocean Technology and Engineering group spent time showcasing their capabilities and scientific equipment. The event started the previous evening with networking drinks at the Philharmonic around the corner from the NOC. This gave those travelling up from the south of England an opportunity to get together prior to the day of presentations. Presentations covered topics such as, reducing ping-to-chart time through autonomous onboard data processing, surveying intertidal areas using X-band marine radar, measurement and monitoring of underwater sound and much more. Presentations from the day are listed below. The 55th Marine Measurement Forum (MMF55) was hosted by ASV Ltd in Portchester, Hampshire at the end of January 2015 and brought together 70 delegates from the ocean community. The day saw 14 presentations from a range of commercial and research organisations, all set in the ASV workshop that, for one day only, was kitted out like a conference centre complete with full size USVs! Pictures and presentations below. Following the opening address from ASV’s Managing Director Dan Hook, the first session commenced with a presentation from Terry Edwards of RS Aqua talking about the advances seen in the Datawell Directional Waverider4 buoy compared to earlier models. The topic of instrumentation was continued by Nortek’s Eric Siegel who discussed using an AD2CP for small vessel surveys, followed by Tom Broomfield of Teledyne Reson looking at the features of SeaBat Sonars and finally by Stephen Andre from Alphecca who illustrated the methods taken to monitor solitons in the ocean. After a networking coffee break, Geraint West from the National Oceanography Centre (NOC) kicked off the second session by outlining the latest in the developments at the new Marine Autonomous and Robotic Systems Innovation Centre (MARSIC) at NOC, Southampton. By facilitating the sharing of ideas, knowledge and information, it is intended that the centre will act as the driver for a coherent Maritime Autonomous Systems (MAS) strategy throughout the UK. David Todd from HR Wallingford went on to describe the organisations impressive new Fast Flow Facility which has the ability to generate waves up to 1m high and flows of over 2.6m/s. After a very well received hot lunch during which delegates took advantage of the opportunity to view the ASV vessels on display and to network extensively, the first presentation in the afternoon session focussing on research and applications saw Dr Alex Nimmo-Smith of Plymouth University talking about holographic imaging of marine suspended particles. He emphasised that this method can improve the ability to identify and characterise particles. The emerging theme of marine autonomy was continued by Russell Wynn from NOC as he shared the stories and lessons learnt from the recently completed MASSMO trial which saw the UKs largest ever deployment of marine robots as the fleet was launched SW England back in October 2014. Other speakers in this session included Dr James Fishwick from Plymouth Marine Laboratory who talked about the work carried out on the Western Channel Observatory using a variety of platforms which can be used for sensor testing. Visiting from Canada, Greg Johnson of RBR treated the audience to a humorous and enlightening explanation of the rationale behind the design of RBR ocean sensors followed by deployment tales of the Liquid Robotics Waveglider from Stephen Auld. Elizabeth Paull from Aquatec Group provided an interesting insight into gathering coastal oceanographic data using “fishing boats of opportunity” and the development of a new temperature and depth recorder capable of delivering immediate results whilst reducing cost per data point. The final presentation of the day was delivered by Sean Newsome from Teledyne SeaBotix who showcased some real life ROV deployments including the recovery of an airplane black box and a victim. The day was brought to a close with a final address from Dan Hook before delegates were invited on a tour of the new ASV facility. Delegates seemed to be very impressed with the day’s event which provided informative presentations, great networking opportunities and a wonderful lunch all for £36 per head. Below are two of the presentations from the day. The 54th Marine Measurement Forum was hosted by Aquatec Group at Marwell Zoo on 4th June 2014. The day started with a golf buggy ride through the park to Marwell House, offering delegates a chance to view a wide variety of animals before registration. Over 35 delegates attended the event, which saw 10 presentations from a diverse range of speakers. Following an introduction, the first speaker of the day was Paul Ridout from OSIL presenting the results of the AMSI Business Trends survey carried out at Oceanology International earlier in the year. The positive trends reported across the industry provoked much lively discussion. Philip Bishop from Fugro EMU then gave a presentation on the vast quantities of real time data collected by the company – 3 million hours and counting! A session on instrumentation followed, commencing with an informative talk on fish tagging by Martin Stemp at RS Aqua. James Williams from Swathe Services Group then presented operational results comparing beam size and resolution of R2SONIC multi-beam sonars. Finally, Gary Hayman from the National Physical Laboratory presented initial results of research into the calibration and characterization of autonomous underwater noise recorders. A break in the weather allowed delegates to explore the zoo at lunch time. The afternoon started with a session on platforms and facilities. Luisa Cristini from the National Oceanography Centre outlined the FixO3 project, which gives the opportunity for commercial companies to partner with research organizations in order to access fixed point observatories. Richard Whitehouse from HR Wallingford concluded the session with details of the exciting new Fast Flow Facility, a state of the art hydrosedimentary testing flume opening in the autumn. Dan Hook, from Autonomous Surface Vehicles, opened the final session of the day on ‘Applications’. His talk on recent applications of ASVs for remote sensing included captivating video footage from recent deployments. Andy Smerdon from the host company, Aquatec Group, gave a fascinating talk on innovative methods of protecting ageing offshore structures using real-time acoustic control. The session and the forum were concluded by Eric Siegel from Nortek Piezo, outlining how composite transducers enable the innovation of acoustic instrumentation. The 53rd Marine Measurement Forum was organised by Xylem Analytics UK and hosted by the National Oceanography Centre, Southampton on Thursday 28th November 2013. The event was particularly well attended with over 60 delegates benefiting from a full programme of presentations, 12 small exhibition displays and a number of fully-subscribed tours. The day began with a welcome and introduction from David Goldsmith, Director of Ocean and Coastal Business for Xylem Analytics, and Geraint West, Director of National Marine Facilities at NOC Southampton. In the first session, Travis Mason from the Channel Coast Observatory explained how backscatter data combined with swathe bathymetry could be used for mapping seabed sediments and habitats. Mark Jonas of Oceanwise Ltd gave an overview of the new Port of London Authority tidal system currently being commissioned, and Dr Martin Bishop of Emeritus Solutions Ltd spoke about the complexities of underwater acoustic processing. To showcase some of the excellent facilities available to scientists at NOC Southampton, delegates were treated to tours of the RRS Discovery (NERC’s latest research vessel), the Marine Autonomous and Robotics Systems division, and the British Ocean Sediments Core Research Facility. Tom Hiller of Teledyne Gavia started the second session of talks explaining how AUV’s can support investigations around offshore infrastructures, and Robin Plumley of NOC Southampton gave an insight into the planning, construction and features of the RRS Discovery. Dr Thomas Mitchell of Sea-Bird Scientific outlined best practice for successful missions with profiling floats, followed by Geraint West of NOC Southampton who highlighted the capabilities of the marine autonomous systems operated by NERC. The final session of the day began with Alastair Stagg of Fugro GEOS explaining the attention to detail required to moor a wave buoy in deeper water for longer periods. Tim Thornton of TeamSurv showed how, with careful assessment of data quality, crowdsourcing bathymetric data can be a valuable resource. The last talk of the day by Ramsay Lind of Nortek UK, introduced the new long range Signature Series instruments. Summarising the day, David Goldsmith said: “As a manufacturer of oceanographic instrumentation, the MMF events provide a great opportunity to network with industry colleagues, and both existing and prospective customers. The next MMF, which will be hosted by Aquatec Group Ltd, will take place mid-2014. Over forty years of experience in oil and gas operations has established Aberdeen as one of the most influential, innovative and proactive energy cities in the world. Several leading international companies are based in the city, which is widely recognised as the Energy Capital of Europe. This innovative, experienced and resilient city is home to a unique concentration of around 900 marine and energy related businesses, agencies, government bodies and research institutes, hence rendering it a both meaningful and appropriate venue for hosting the 52nd edition of the Marine Measurement Forum (MMF). Organised and hosted by underwater technology specialists MacArtney, at the MacArtney Group UK facilities in Aberdeen, the 52nd MMF brought together the scientific measurement community for a day devoted to the informal sharing of knowledge and ideas within the realm of marine scientific measurement. The course of the day embraced several interesting features and sessions, hereunder a number of presentations on the latest developments within the diverse field of marine measurement technology – hereby allowing delegates from a diverse range of companies and organisations within the measurement community to explore and share new technologies, projects, equipment evolutions and survey processes. The 52nd MMF was opened and introduced by Mike Sawkins – MacArtney System Sales Manager (Ocean Science) and the Managing Director of MacArtney UK, David Buchan. Following this introduction, the event proceeded with the interesting input of a range of dedicated and inspiring speakers. The first delegate to take the stage was John Upton of Shell UK Ltd who gave an informative presentation featuring a review of storm events in the North Sea. Next came a couple of interesting presentations focused on the reviewing of a comprehensive hydrographic and sonar data processing system, by Trish Groves off CARIS Geographic Information Systems BV, and a session on the use of enhanced capabilities in multibeam technology to capture detail in underwater measurement, presented by Pim Kuus of RESON Offshore Ltd. Subsequently, Andy Smerdon of the Aquatec Group provided a detailed outline of hydrotest monitoring, hereunder the adaptation of oceanographic instrumentation to subsea pipeline testing. After that, Nortek’s Gordon Jones offered a detailed insight into the realm of real-time monitoring of scour on jack-up vessels. Last but not least, Ed Cheesman of Teledyne Blueview added interesting perspective and detail to the use of high resolution multibeam acoustics for Imaging, measurement and sensor based automation. 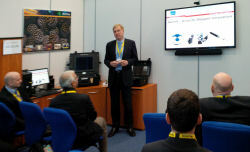 During the course of the day, which also offered several coffee breaks, a buffet lunch and other valuable networking opportunities – MacArtney UK outlined and detailed the multitude of underwater technology products, services and system solutions offered by the worldwide MacArtney Group with a corporate presentation. The day was rounded off with a tour of MacArtney UK’s purpose built underwater technology facilities. This was well received among the delegates who agreed that all in all, the 52nd MMF had proven an interesting, rewarding and overall successful event. The next MMF was announced to take place in late 2013, and will be hosted by Xylem Analytics UK.